The majority of Americans 65 and over have a strong history in the faith community and have attended services routinely in their past. As they become less able, their attendance declines and finally ends resulting in them missing out on much needed fellowship, encouragement, prayer, singing, communion, spiritual and physical assistance and in some cases financial assessment. With statistics indicating that by January 1, 2016 over 10,000 Americans will cross the threshold of age 65 every day, the church must be ready to provide the resources, education, and care needed to help their people in time of need. With that said, Missouri Palliative & Hospice Care will encourage the faith based community to partner with us as we endeavor to provide their aging community the care that they need and the comfort that they deserve. Spiritual pain and suffering is just as real and powerful as physical or emotional pain, Missouri Palliative & Hospice Care is aware of this and emphasizes spiritual care. There are many spiritual and religious issues people who have a serious illness may face and struggle with. Missouri Palliative & Hospice Care and faith communities share a deep concern for spiritual care. Serious illness, caregiving, the end-of-life and grief raise many spiritual issues, including questions of meaning, purpose, guilt, forgiveness, suffering, healing and hope. Many people who are very ill question what their life means. They may wonder if they have done anything positive or lasting with their life. Some people ask “Why me?” or “Why now?” or “Why this illness?” The search for meaning and purpose may bring up a wide range of emotions, from anger and loss to relief and peace. Struggling with these questions can be a normal part of dealing with illness. As people face illness, they may reflect on difficult situations and experiences in the past. They may feel guilty about or blame others for things that have happened. Living with a serious illness can cause people to question their spiritual beliefs or faith. They may explore thoughts and feelings that differ from long-held beliefs. They may become angry with God, their religion, themselves, or with others who think they should believe a certain way. 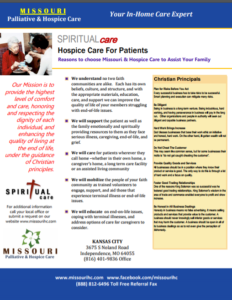 Contact us today to learn the many benefits of the Medicare Hospice Benefit and the difference in Faith and Spiritual care you will receive with Missouri Palliative & Hospice Care! Copyright © 2019 Missouri Palliative & Hospice Care. Proudly powered by WordPress	& The WP Theme by ceewp.com.